Find pictures of Igloo and discover interesting facts and information about the Igloo. The Igloo was a typical structure used as a shelter or house style that was built by the people of the Inuit tribe who inhabited the Arctic regions of Alaska, Greenland and Canada. Constructed from blocks of snow, igloos were fast to build and featured tunnels leading to the entrance that was covered by animal hides, such as the caribou. Learn about the structure and the interior of the Igloo with pictures and images together with facts and information about this unique type of shelter. What does the word Igloo mean? Definition: The Igloo, also known as a snow house, is a round, dome-shaped shelter built of snow, originally constructed by the Inuit Tribe. Igloos were made made from blocks of compacted snow and built in various sizes, sometimes housing up to twenty people. The name Igloo derives from the word 'Iglu' meaning "house, dwelling" in the Eskimo-Aleut language. 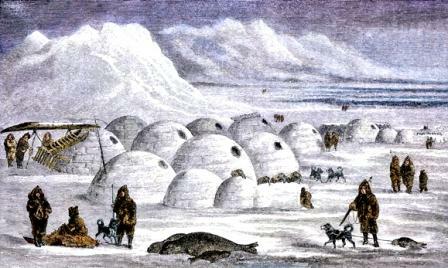 Why was the Igloo built as an Inuit shelter or house style? Every tribe choose a type of housing to suit their lifestyle, the climate, the environment and the natural resources (known as biomes) that were available to them, and the Inuit tribe were no different. The Igloo was chosen as the most suitable type of house for the Inuit tribe who lived in the Arctic regions of Alaska, Canada and Greenland. The cold, harsh climate and the barren, treeless landscape of the Artic tundra resulted in Igloos or snow houses being built as their shelters. Snow is a very good insulator which means that the igloo was able to retain its heat. The trapped heat inside the structure caused the igloo to melt slightly. The melted snow would then refreeze when the igloos was unoccupied. The thawing and refreezing cycle resulted in the entire structure becoming solid ice, which was even stronger and warmer than the original structure made from blocks of snow. How was an Igloo built? The interior of the Inuit igloos was warm, but ventilation was poor. Benches made of snow blocks were built around the walls serving as seats during the day time and a base for the beds at night. The platforms were covered with caribou skins and furs. Animal skins were also used as door flaps to keep warm air in and the cold wind out. A stone lamp, suspended from the ceiling called a 'kudlik' provided light, and also gave off heat. Harpoons and spears were stored in the roof area. Ceremonies and rituals took place in the large igloos. The most prominent ritual figure was the 'angakok', the shaman who communed with spirits by the rhythm of a single-headed drum and by lively dancing.